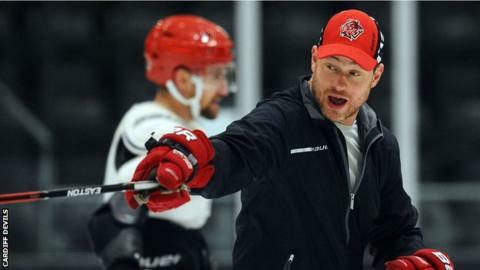 Cardiff Devils are "confident and prepared" for their final two matches of the regular season this weekend according to head coach Andrew Lord. Devils are two points clear at the top of the Elite League with Belfast Giants right on their heels after 58 games. But wins against both MK Lightning on Saturday and Coventry Blaze on Sunday will guarantee the Devils a third successive Elite League title. "There are no easy nights, I wish there was but there are not," said Lord. "We have to go out and win the game and that is what you want as a professional athlete. "You want the challenge, big games, and fortunately we have done this for a number of years." Nearest rivals Giants, who have won eight of the last nine matches, won the first of their two final matches on Friday, hammering Fife Flyers 7-0 to go top on goal difference. Belfast's regular season campaign finishes a day earlier than Devils. If Adam Keefe's side lose at home against Dundee on Saturday, the Devils will only need one win from their two games to take the honours. However, if Giants beat Dundee, the Devils will travel to Coventry knowing defeat would see them miss out on the title on the final day of the season. "We have to go out on Saturday, start well and that is what we are focused on," said Lord. "You can get worried about calculations and what could and could not happen but that will not help the guys. "It is amazing, some 60 games later and it is still down to the final weekend, it is wild and it is fun but we're confident and prepared. "We have forgotten there are actually play-offs after this because we are 100% dialled in for Saturday. "Anything can happen in hockey but we are doing everything we can to give ourselves the best chance." During Lord's reign the Devils have enjoyed the most successful period since the early 1990s, when they won back-to-back league and play-off titles. But two wins this weekend will bring about a third successive title, something which has never been done in the club's 33-year history. In fact, no team has won the league title in three consecutive seasons since the creation of the British Hockey League in 1980. And for Lord, who did not experience such levels of success as a player, the chance to do so as a coach brings huge excitement. "I have been on a lot of losing teams in my career but fortunately as a coach I have only been in Cardiff and we have had four great seasons," said Lord. "Putting yourself out there to be the very best can be a little anxious and scary at times but I would not have it any other way because it is so much fun."